I would to obtain, using the Legrand Orange Book source and his structure.tex file, an appendix (in Italian language) done only with the letters of the alphabet. The several parts, different from the appendix, must to start with the arabic numerals from 1, 2, 3, etc. With my long source structure.tex with many different \usepackage I can only do this after many attempts. 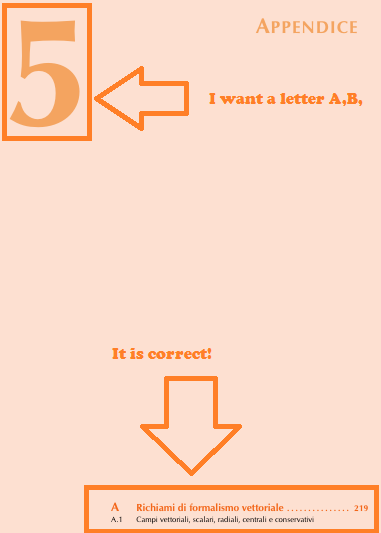 but I have always an arabic number and I have not the letter A. I have made many attempts but I have not succeeded as can be seen from the image. Thank you in advance for yours help. Undo the changes in structure.tex from your previous question regarding part numbering or use the original structure.tex. 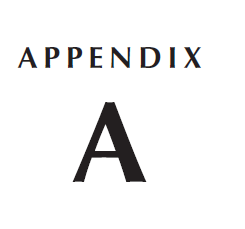 This assumes that the appendix is at the end of the document. A general remark: You are using a rather complex template from a commercial site. You can't handle this template and can't create minimal examples from it. I don't think that it is okay to expect free support in such a case. I also think that it is quite ineffective to spent hours on questions if you don't have the knowledge to create sensible minimal examples. See also Why should you avoid using (complex) templates?. Not the answer you're looking for? Browse other questions tagged appendices parts or ask your own question. Why should you avoid using (complex) templates?